Do you find yourself craving knockwurst, bratwurst, grilled onions, sauerkraut, and spicy mustard? Have you smothered the desire to shout out “eins, zwei, drei g’suffa” or “prost” or “zicke-zacke, hoi, hoi, hoi”? Have you felt the urge to wander down the budenstrasse or do the chicken dance? Have you been shopping for lederhosen or a very special dirndl? Of course you have! It’s October and that means thousands of Americans are heading up to the tourist communities in their nearby mountains to enjoy the festivities. If you live in Los Angeles, that means you’re going to the Big Bear Lake 32nd Annual Oktoberfest. So how did Oktoberfest start anyway? In 1810, the German Prince Ludwig I held a reception party for his new wife, Princess Therese Sachsen-Hildurghausen. The Bavarians, who were exhausted by the harvest, gathered and celebrated the wedding and continued drinking all day and night! Held in a meadow (or wiese) outside of the gates of Munich, the party was so successful, the community gathered every year after to celebrate the anniversary of their prince’s wedding and the anniversary of the party itself! The Bavarians even named the meadow Theresewiese in honor of their prince’s new bride. And, of course, what’s Oktoberfest without beer? Those in Munich take beer very seriously. At this original festival, an old German law states that only beers brewed in Munich can be served at the festivities. 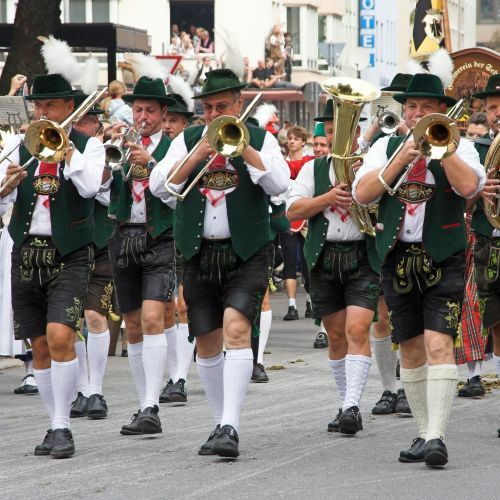 In the convention center in Big Bear this October, revelers can dance to the sounds of the native German Appentaler Band and then, later in the month, the American Express Band will play old German favorites with rock and roll classics mixed in. Of course, you can also see women compete to be the queen of Oktoberfest by carrying the most steins over the finish line. Or you can watch the log sawing contest. Or buy a one dollar raffle ticket to win the Rotary Club’s commemorative silver stein. Or, come on, you can even compete in the stein holding contest. Hold a stein up at ninety degrees for two minutes and there’s no need for an upper body workout at the gym that week! So if you’re tired of breathing smog or sitting in traffic or standing in line at the post office, take a break, drive into your local mountains, and say a toast for me. Before you know it, you’ll be overwhelmed with a feeling of gemutlichkeit. Mark my words.